Spa Marvel Hot Tub Contest! Visit your local Viscount Location for great deals on hot tubs and accessories. As the weather gets cooler, everybody moves from the swimming pool to the hot tub. Here at Viscount we want to see how you celebrate the fall with your hot tub with a photo contest! 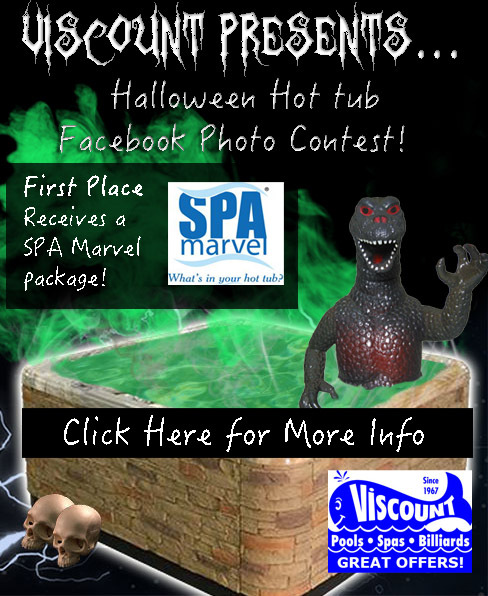 We want to see your funniest, most original, and best hot tub Halloween or fall themed photo for our Spa Marvel Hot Tub Photo contest! First Place – Will receive SPA Marvel package! This package will include one of each bottle of Spa Marvel brand spa-water treatment product. -Post your Funny Hot Tub Photo in the Comments below to be considered!